To the churches scattered throughout the Roman provinces in Asia Minor, who were experiencing persecution, Peter identifies the real enemy. 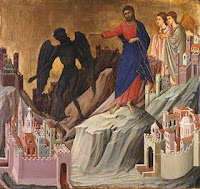 Not Rome, not even Nero, but “your adversary the devil.” He was well aware that this was a spiritual warfare. As Paul said, “We do not wrestle against flesh and blood, but against principalities, against powers, against the rulers of the darkness of this age, against spiritual hosts of wickedness in the heavenly places” (Ephesians 6:12). The Greek word for “adversary” is antidikos, made up of two words: anti, which means “against,” and dikos, which speaks of what is right and just. Literally, it refers to an opponent in a lawsuit. The name satan means “adversary” and he is called the “accuser of the brethren” (Revelation 12:10). The Greek word for “devil,” means “slanderer.” He comes making accusation against us, slandering us before God, before others and even before ourselves. He seeks to turn the world against us and is the source behind all persecution. The devil is like a roaring lion look for someone to destroy. Though speaking figuratively, Peter may also have had in mind the Christians at Rome who were literally being thrown to the lions. “Resist him,” Peter says. The Greek word, antihistemi, means to take a stand against. When the devil comes against us with lies and persecutions, we are to stand against him by staying firm in the faith. 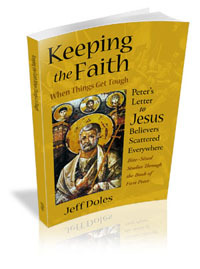 Notice the definite article, “the faith.” The focus is on the object of our faith, King Jesus the Messiah. The apostle James put it this way: “Therefore submit to God. 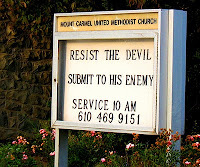 Resist the devil and he will flee from you” (James 4:7). First, we submit ourselves to God, taking our stand in Him. Then we will be well positioned to stand against the devil. The attack of the adversary was not against these scattered churches alone, nor would they be alone in standing against him. There were many other believers also experiencing the same persecution — and faithfully resisting the devil. Again, Peter may have had in mind the tribulation believers faced at Rome. They also had something much more powerful going for them, which Peter brings out by way of his closing benediction. The “God of all grace” would be with them and the adversary is no match for that. God has called us to eternal glory by Jesus the Messiah, Peter says, bringing us around again to the abundant mercy, living hope and incorruptible inheritance we have in Jesus, with which he opened this letter. The brief times — the word for “a while” actually means “a little” — of persecution do not compare to the rich and eternal inheritance we have in Him. The grace of God is here to “perfect, establish, strengthen and settle” us. The word for “perfect” has a range of meaning, any of which would be encouraging for those facing difficult times: to prepare, repair, restore, equip, make whole. To “establish” means to stabilize, make firm or constant. “Strengthen” means to make strong in body or soul; here, with the strength that comes from God. “Be strong in the Lord and in the power of His might,” Paul said (Ephesians 6:10). To “settle” means to set on a firm foundation. Peter finishes with a doxology, a praise to the God of all grace for this eternal glory: “To Him be the glory and the dominion forever and ever. Amen.” It is His glory and His dominion that will endure long after every persecution and difficulty has passed away.